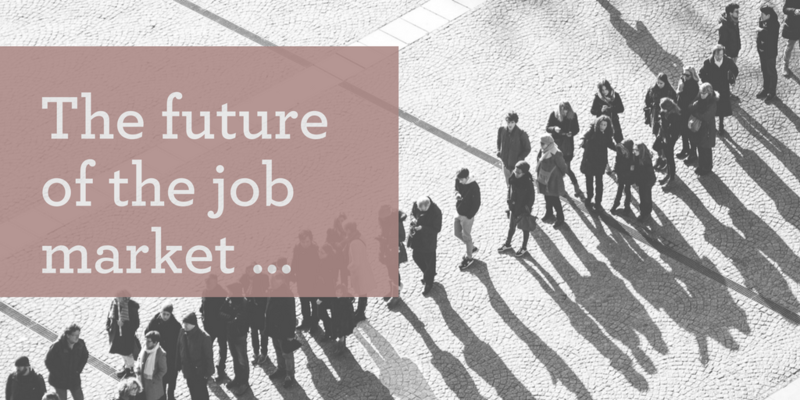 Whoever said there’s nothing more certain than change may well have been thinking about the future of the job market. As 2017 draws to a close it’s worth reflecting on what indicators there are in the job market so we can start thinking about how to prepare for the landscape ahead. Demographic changes and technological advancements suggest that there may be a significant loss of certain types of jobs globally. A report published by the World Economic Forum estimates that a total of 7.1 million jobs could be lost, the majority of which will be white-collar office and administrative jobs. However, there will be a paradigm shift when it comes to the creation of new jobs. This blog will explore some of those key areas. This of course is a macro perspective and once we zoom in onto our tiny microcosm here in Jersey we are still aware of this global perspective, however we need to be in tune with the unique environment of where we live and work. Ours is very much finance focused with a very specific job market in terms of skill-sets. With that said, we haven’t been immune from the financial crisis which sent markets into a spin a decade ago, impacting both traditional loans and venture capital availability. However, the job market in 2017 has been robust with a healthy increase in new opportunities across the IT and finance sectors. Post Brexit we can only hope for further stability to help support our finance sector, experts agree; maintaining stability in the financial sector is important not only for firm-level productivity, but also to stimulate investment in innovation. We recently read a report entitled ‘The Future of Jobs’ which surveyed executives from more than 350 employers across nine industries in 15 of the world’s largest economies. The report published its predictions about how the labour markets will evolve. For example the report predicts that there will also be certain occupations that will be more in demand. Data analysts will be in demand. According to the report, data analysts will become increasingly more important in all industries by 2020. We currently see this as a growing trend. Interestingly, the survey respondents also said they expect to have a greater demand for data analysts because they will need help making sense of all of the data generated by technological disruptions. Computer and mathematical jobs as a whole will also continue to get a boost. Jobs that fall under the computer and mathematical occupations will grow. These occupations include computer programmers, software developers, information security analysts, and more. Architects and engineering jobs will remain stable. During the next four years, the demand for those skilled in architecture and engineering will continue to increase. Specifically, the report states there will be growth for engineers focused on biochemicals, nanotechnology, robotics, and materials. By 2020, 2 million jobs will be created worldwide that fall under computer and mathematical and architecture and engineering related fields, according to the report. We continue to ‘watch this space’ in Jersey to see if the vision for a ‘digital Jersey’ will materialise. More specialised sales people will also be needed. As technological advancements continue to disrupt industries, there will be a growing need for specialised sales people who can explain the company's offerings to a wide range of clients, including businesses, governments, consumers, as well as to new clients that the company has never worked with before. For example, as content is increasingly consumed on mobile devices, a digital media company would want to hire sales people who are knowledgeable with the ins and outs of mobile advertising. Expert copywriters and communicators will become more important mediators between technical companies and the wider publics. Industries that will need these new types of senior managers include media, entertainment, and information, according to the report. All of these sectors are not the mainstay in Jersey but we see significant growth in the area of marketing and communications. Product designers aren't going anywhere. One of the top skills that will be in demand by 2020 is creativity. This will occur because while a lot of monotonous jobs can be automated, creative jobs still require a human. Innovative thinking and the ability to think outside the box are still very much part of the well rounded senior candidate. Human resources and organisational development specialists will also be needed to help re-skill workers. In fact, according to the report, 65% of respondents said that they are investing in reskilling current employees. We see this with our clients many of whom are heavily invested in retaining talent. Many HR professionals are currently aware of the need to help employees develop new skill sets. Demand for regulatory and government relations experts will continue to increase as companies embrace new technologies. For example, as traditional car makers and tech companies both develop driverless cars, they are also hiring people to understand the relevant laws and to work with government regulators in figuring out the best way to implement the technology. Jersey is very well poised for the legal sector to grow. Our latest roles reflect already these trends. The survey highlights the importance of having good relationships with our candidates and clients. Our ethos is about developing these key relationships and taking a bespoke, personal approach to help match our candidates with the right roles. Please contact us for more information on this survey or any of our current opportunities.